Our fiftieth anniversary issue! Poetry by Robin Skelton, Janet Rogers, Tim Lilburn, Julie Paul, Lorna Crozier, and more; Fiction by Terence Young, Morgan Cross, Jason Jobin, and Brock Zawila; CNF by Emily Carr, Charles Lillard, Sheila Munro, Madeline Sonik, Annabel Howard, and Paige Lindsay. Looking to keep the sun shining this fall? Why not subscribe to The Malahat Review at our lowest rate ever? $12 for one year! In the October 2017 Publishing Tip, Robin Richardson tells us what not to include in our biographies and submission letters, and reassures us that everyone gets rejected. 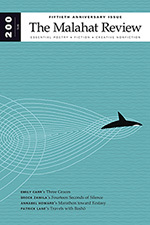 Malahat volunteer Rose Morris summarizes 2001’s spring issue, which features work by Jan Zwicky, Bill Gaston, Patrick Friesen, and other notable Canadian authors. Only Four Weeks Left Until November 1 Deadline! Additional entries cost $10 CAD from anywhere, no limit! Keep your eyes on this year's BIG prize: three awards of $2000! Our annual Open Season Contest is underway, and writers of all levels are invited to enter poetry, fiction, and/or creative nonfiction. There's no theme or specific criteria for this contest, so go wild and send us your best work. Final judges are Evelyn Lau (poetry), Carleigh Baker (fiction), and Betsy Warland (creative nonfiction). Click their names to read interviews with the judges on what they'll be looking for in this year's submissions. Full contest guidelines available on the Malahat website. Malahat volunteer Rose Morris talks with Kate Kennedy about perfectionism, physical fixedness, and perspective in her poem "Parallax," set to appear in Issue #200. RM: In addition to being a poet, you are a professional editor. Do you find it difficult to edit your own work? KK: At the risk of sounding like that person at the job interview who says their weakness is perfectionism, being an editor might have made me a little too ready to edit my own work. I sometimes plunge into the revisions before I’ve let the poem cool off, only to come all the way around to preferring the first incarnation of certain lines over my tinkered version. But I suppose that’s not the worst way to come to a decision. At the same time, I’m absolutely not a believer in the whole “first word, best word” idea. I’ve had poems go through pretty extensive revisions before I got them to where they could go into the world by themselves. Read the rest of Kate's interview on the Malahat website. Malahat volunteer Liam Workman talks in person with Brock Zawila about "The Lake Blouin Symphony: A Listening Guide," his fiction piece on the stories that music tells, set to be published in Issue #200. LW: The first thing that stood out to me in your story was the FLQ (Front de libération du Québec) elements that you worked in, and kept coming back to throughout the story, and how you fit them into the larger Québec setting as a whole. Was the story always set in Québec in that time period? BZ: Yes it was. Whenever I don't know what to write about, I dive into something I know nothing about, or almost nothing about. I didn't know anything about rural Québec, and you look at a Canadian map and it seems like blank space other than Montreal, and maybe some other spots, and it was a place I wanted to explore, and this seemed like a good time period to explore it in. So I think that's why I ended up going with the FLQ crisis. I also started writing it back in 2014/2015, and it felt particularly relevant at the time because it is such a strange part of Canadian history where domestic terrorism was a real threat for probably seven or eight months and probably historically over the next decade or two. So, it seemed relevant to the current contemporary situation. Read the rest of Brock's interview on the Malahat website. To unsubscribe from our mailing list, CLICK HERE, scroll to the bottom of the page, and type in your email address beside the box labelled "Unsubscribe or edit options".